An even crisper, warmer toned MONOCLE hits news stands around the world today, as the global affairs and lifestyle magazine starts a new chapter with a German printing house and makes subtle, but important changes on the page. 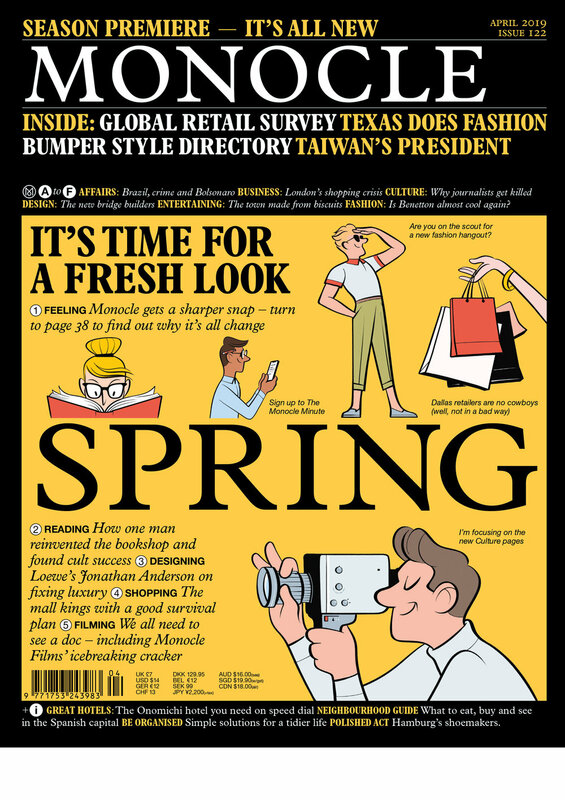 The April issue – out today, Thursday, 21 March – leads with MONOCLE's manifesto on why physical shops will always beat e-commerce hands down, featuring a look at some of the best new outlets from around the world. There are interviews with Taiwan's president, Tsai Ing-wen, the newly appointed artistic director of Benetton, Jean-Charles de Castelbajac, and the creative director of Loewe, Jonathan Anderson. MONOCLE looks beyond Stetsons, spurs, flash and cash to show that Texas is looking kind of cool, talks to the architects and engineers who use bridges to brand cities, and celebrates a new book dedicated to journalists who have lost their lives in the line of duty. MONOCLE launches the new issue – printed on matt-coated premium paper by Neef & Stumme, in Wittingen, near Hamburg – alongside its hot-off-the-press Hamburg travel guide at the Café Paris in Hamburg tonight. Launched in 2007, MONOCLE is a premium media brand offering high-quality journalism across its magazine, web and broadcast divisions. Led by editor in chief Tyler Brûlé, it is the leading edit on global affairs, business, culture and design. MONOCLE’s magazine publishes 10 times a year and is distributed in more than 65 markets, selling more than 84,000 copies per issue. The media brand also produces three seasonal publications: The Forecast, packed with key insights for the year ahead; The Escapist, a travel-minded summer special; and The Drinking & Dining Directory for the best in hospitality. MONOCLE also curates a round-the-clock radio station, MONOCLE 24; a dynamic website; high-quality films and slideshows; live events; retail and café locations; and a collection of travel books and lifestyle guides, launched in partnership with Berlin publisher Gestalten. Tyler Brûlé is widely considered to be one of the most influential media innovators of his generation. He is the youngest-ever recipient of the British Society of Magazine Editors Lifetime Achievement Award and has been named Ad Age’s editor of the year, an unprecedented award for an international editor. Brûlé moved from Canada to the UK to pursue his career, working as a reporter for the BBC before turning his hand to print journalism, writing for publications including The Independent, The Sunday Times and Vanity Fair. Brûlé launched award-winning magazine Wallpaper* in 1996, a publishing phenomenon that brought together the worlds of design, architecture, fashion, food and travel in one title for the first time and went on to sell in more than 50 countries. In 2007 he launched MONOCLE, which has grown into a distinctive and much-admired global media brand.